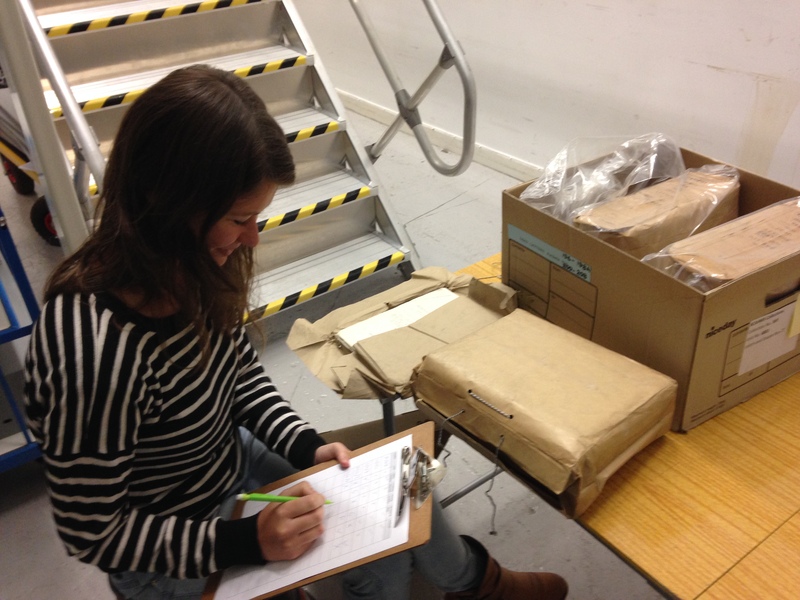 In this week’s blog post, we hear from Project Conservator, Emily Hick, who recently carried out a self-led continuing professional development project at the CRC, which was funded by the June Baker Trust Grants for Emerging Conservators…. The June Baker Trust was set up in 1990 to promote and encourage the development and study of the conservation of either historical or artistic artefacts in Scotland. Since that time the scheme has awarded more than £25,000 in grants to Scottish conservators for continuous professional development. The success of these awards led the trustees to develop a new strand of funding for emerging conservators, which has been made possible this year thanks to the generosity of the Gordon Fraser Charitable Trust. In May 2015, three newly qualified conservators based in Scotland, received awards of up to £1000 each from the June Baker Trust to carry out a project of their own design, and I was lucky enough to be one of them. My project focused on developing my skills of carrying out surveys for conservation work. I chose to focus on this area after analysing my CV and finding that this was an area of weakness. It is difficult to gain these types of skills as an emerging conservator as often a project has been scoped out before a position starts. If mistakes are made while surveying a collection, and incorrect time and material estimates are given, it can result in going over budget and over time. So these are vital skills to develop. The project lasted four weeks in total, and I began by spending a day at Royal Commission of Historic and Ancient Monuments in Scotland (RCHAMS). During this time they were carrying out a survey of their whole collection prior to a merger with Historic Scotland. Due to the limited time available, they had developed a very basic survey to gain condition and current housing data. I helped carry out this survey and was also shown a previous, more detailed survey of the whole collection that had been carried out 5 years beforehand, as well as several other types of surveys they had done in the past. I also spent two days at the National Library of Scotland (NLS). Here I was shown several surveys in a range of styles; A Preservation Assessment Survey (PAS) of the whole collection using a random sampling method, an item by item survey of the photographic collection, and a basic survey of bound volumes prior to digitisation. The conservators talked about how they change the criteria of the survey depending on how the results would be used, rather than having a ‘one size fits all’ approach, and gave useful tips about what types of questions to include. I also helped to carry out a survey of a collection of printed ballads. 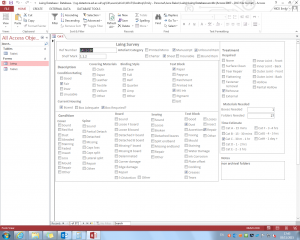 I was also shown how to create a Microsoft Access Database to make my own survey form. Following this, I then spent two days carrying out research on survey methods, spending time at Edinburgh University Library and at the National Library Scotland. 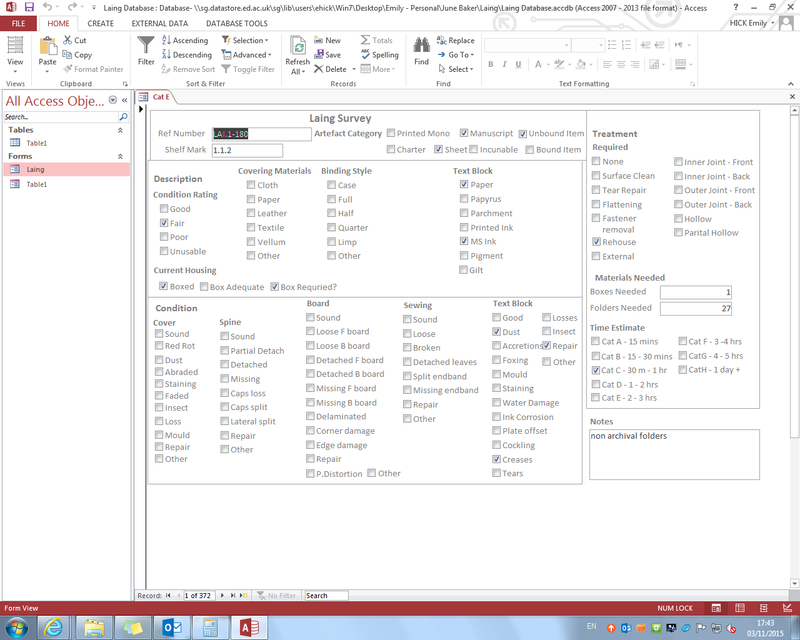 I also took a day to create two surveys databases on Microsoft Access Database for use in carrying out two collection reviews at the CRC. At the CRC, I carried out three surveys in total; an item by item survey of the Oriental Manuscripts collection (5 days), and a random sample survey of the Laing collection (5 days). Following this, I spent two days writing up reports which included information on the condition of the collections, recommendations for future work, materials needed and time estimates. I also spent two days carrying out a brief survey on the use of space in the store rooms, suggesting how items could be repackaged to make more efficient use of the shelving. This project has been hugely beneficial to me and helped me gain surveying skills which are frequently asked for in more senior conservation job descriptions. I hope that the reports will also be useful to the CRC and inform future funding bids. Hello, my name is Katharine – I’m the new Intern with the Conservation department at the Centre for Research Collections. Having spent the last four years working in collections care in historic houses, I was keen to branch out and experience a different working environment in conservation. I’m thrilled to have been given this opportunity to work with the research collections at Edinburgh University. It has been interesting to learn about the challenges of managing a working research collection and the conservation issues that come with it. 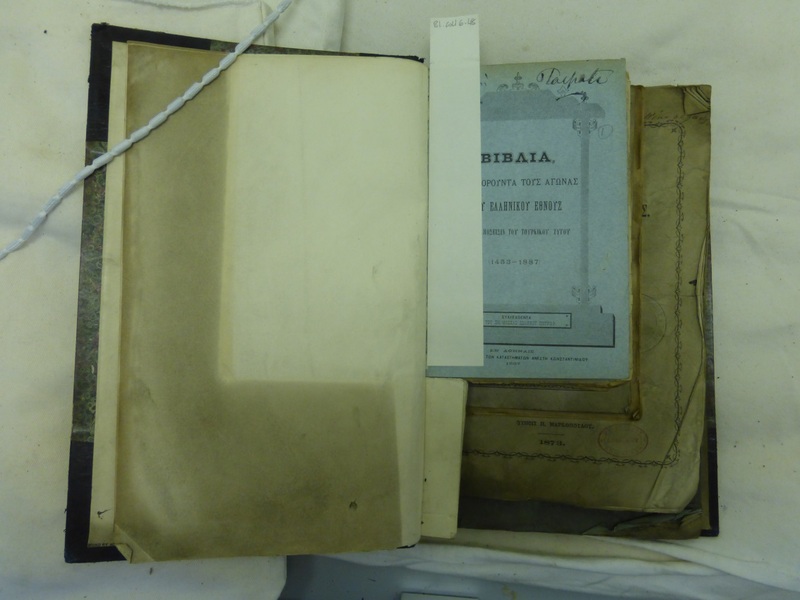 I’m working with Project Conservator, Emily Hick, for 10 weeks, to conserve and rehouse a collection of Greek books owned by John Stuart Blackie, Professor of Greek at Edinburgh University from 1852 to 1882. The collection was largely in poor condition; most of the books were very dusty and had suffered some degree physical damage from years of use and exposure. 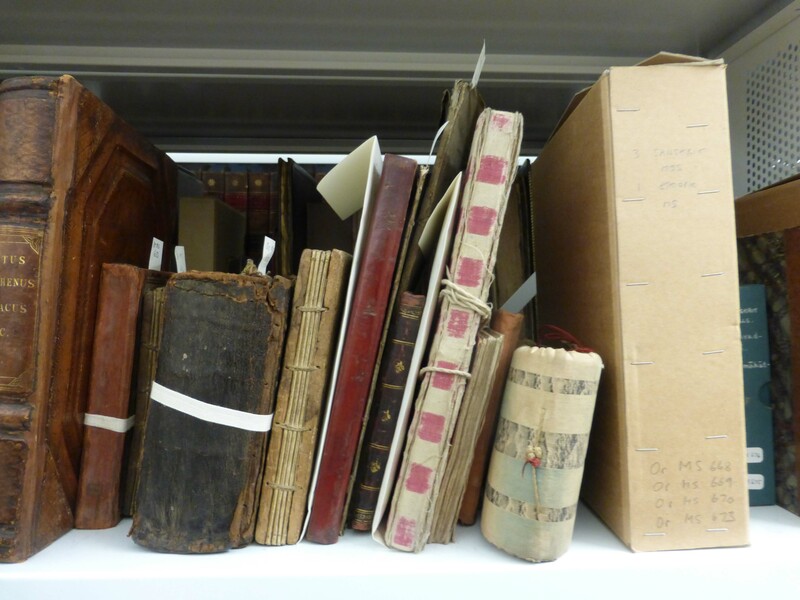 In this state, many of the books were unable to be used by researchers without suffering further damage. The aim of this project is to stabilise and protect the collection and thus making it accessible to researchers. The first step of the project was to surface clean the collection. To save time only the edges of the text block and end papers of the books were cleaned, as these are typically the areas where most dust accumulates on books. I started by removing loose surface dirt using a vacuum cleaner with on low suction setting and a soft brush attachment. I then removed the ingrained surface dirt using smoke sponge. As I finished cleaning each shelf of books Emily started the interventive conservation treatments, which has included consolidation of red rot, and re-attaching loose boards and spines. 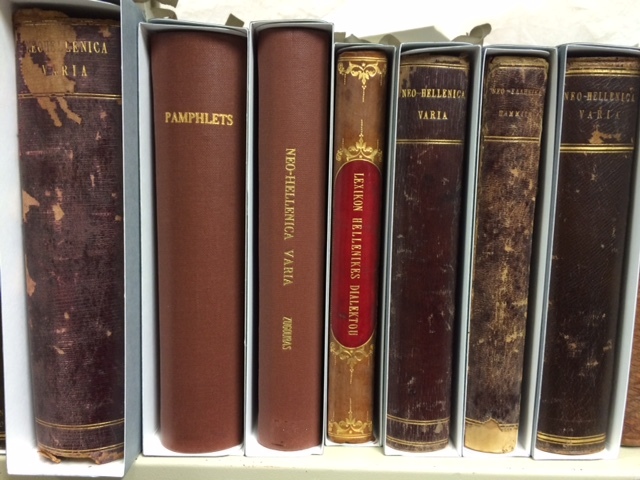 Once the books have received their treatment rehousing can begin. 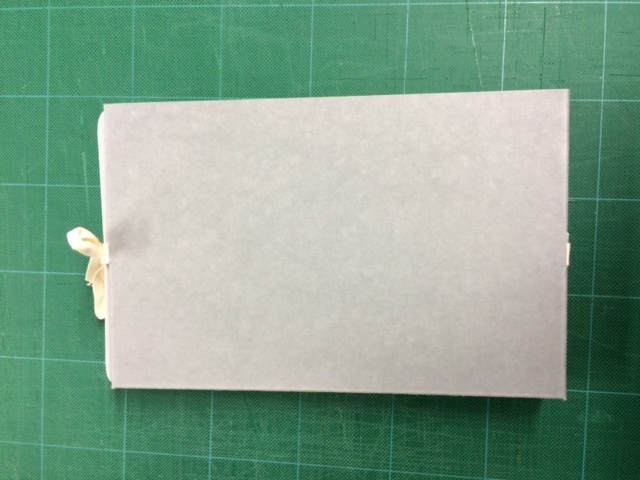 Each book is to be given its own made-to-measure enclosure made of acid-free box board. The book enclosures are a relatively simple design. 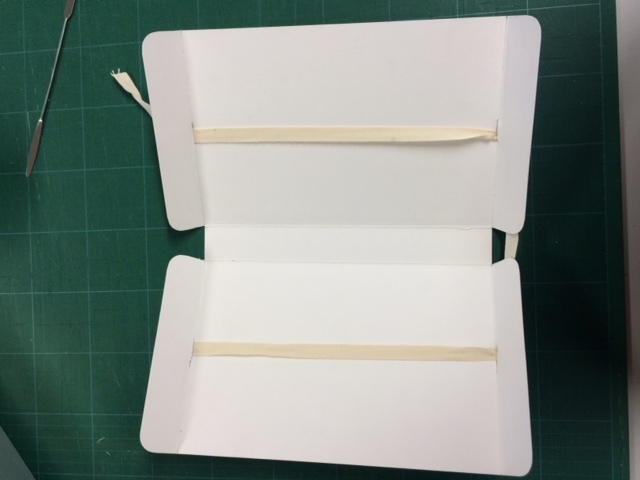 The box board is cut to fit the book’s shape as closely as possible, folded together and fastened with cotton archival tape. By using this design we avoid using adhesives which release potentially harmful gases that may damage the books. The enclosures will protect the books from physical damage caused be handling, and in addition will act as a barrier against dust and the environment while the books are in storage. Keep an eye out for future posts about this project over the next couple of months!